Nope. That's not going to work. There must be a better way to manage the angst of impeding deliverables. And there is. I started using this technique a couple of years back, largely as a way of managing interruptions. "I've got 15 minutes left in my Pomodoro, can I get back to you then?" I used the website http://tomatoi.st, and my coworkers got used to seeing an ominous downwards ticking on one of my monitors... "Oh great, I can bother Dan in 14:35, 14:34, 14:33..." This proved a very good way of carving out half hour chunks of focus, but I was only using a small part of the technique. Recently, I've read a couple of books on this, and have double down on the tomato timer. I got a real timer. Cirillo writes eloquently of the learned effect of the ticking tomato... The ticking means you're focused. All is well in the world. You're on task. I started doing planning and reviews. This is the real power of the technique. You keep an inventory of things you can do (analogous to a Scrum product backlog), then you pick the things you are going to do today (like a Scrum iteration backlog), and put one or more boxes after each task, for the number of pomodori you think it will take. You track external interruptions with a hyphen, and internal interruptions ("How did I find myself on Twitter?") with an apostrophe. Then you do a mini retro at the end of the day, and log stats. Most important is the number of pomodori you were able to do (your velocity), and whether you were successful in making it through your to do list. Also of interest is the number of interruptions, internal and external. [Full disclosure... my pomodoro records have slipped. I need to pick up the habit again. Agilistas would call this "Pomodoro But..."]. One thing I find very appealing about the technique is that you can tweak your logging based on what you want to work on. Suppose you want to get better at handling interruptions promptly. You could use a different symbol, say a plus, for interruptions you were able to negotiate and resolve within a minute or so, and then track your plus to minus ratio over a few days until it got where you wanted it to be. Just as with Scrum retros you pick one thing you want to work on as a team in the next Sprint, you do the same thing, at a personal level, with pomdoro records. I stopped using break time to deal with interruptions, instead moving them into separate, "cleanup" pomodori. Breaks are sacred. You need to keep the motor humming. I got to see the power of this recently in a large group meeting. My "sadness spidey sense" could see the energy slip out of the room as we worked through a very long task list, and I proposed we break for 10. We did. It was a different group that came back in. Ten people working at double or triple efficiency. Do the math. "But I'm in a flow!" Yes, and that may be good, or that may be bad. Coming back to tasks at a regular intervals offers a constant stream of "hey we could just do this" moments, that IMHO more than compensate for the interruption. "Twenty-five minutes is too short." I hear that a lot, and then people often change their tune after they try it. It's a really good length for easing you into concentration at the start of your day, and it's a manageable length when you start getting tired towards the end of the day. You tell me you can go without looking at blogs or twitter or Slack for 90 minutes on a regular basis? I'm not sure I believe you. The idea is to push yourself to do a quantum of total focus, then breathe. Do the reps, then recharge, then do the reps. But... if you really are constituted differently from the way I am, and can maintain absolute focus for 45 minutes, then make that your increment. "My boss won't let me take breaks." Maybe not. Say you want to stand up and stretch every 30 minutes. You can probably get away with that. And if you produce a solid stream of focused pomodori in a day, you are going to get a lot done. I don't think this is going to be an issue. "People expect immediate responses." Sometimes. Sometimes they just want a realistic prediction. "I'm in the middle of something, can I get back to you in 15 minutes?" is professional, respectful, and if the building is not burning down, usually acceptable. Sometimes it isn't. Then void the pomodoro and do what you need to do. "There is no way I can go for 25 minutes without Twitter/Facebook/Linkedin/Vine/Twitch/Whatever." Hmmm. Maybe emulate Signore Cirrillo, and start with 10 minutes. We all have to start somewhere. Sometimes, if you are not sleeping well, you look at the clock, and it says 11 PM. That's a good feeling--"I thought it was going to be 4 AM; still plenty of time left". You will feel exactly the same thing looking at your tomato timer, and saying, ah, still at 22 minutes, there's still plenty of time left. Cirrillo's book is quite good. As is this one, which gets into some of the brain science that makes it work. And props to John Sonmez, who in this interview pointed out a key benefit of the technique as a boon to estimation ("you start thinking a blog post takes three pomodori"). Well, this one took 2.5... A little time left to proof it. ... tick, tick, tick,...DING! <3 the post, I downloaded free countdown timer app on my windows machine and have been using that. Didn't realise there was a site and have been meaning to get that timer for a long time! Keep focusing! Like I am not whilst I read your post! 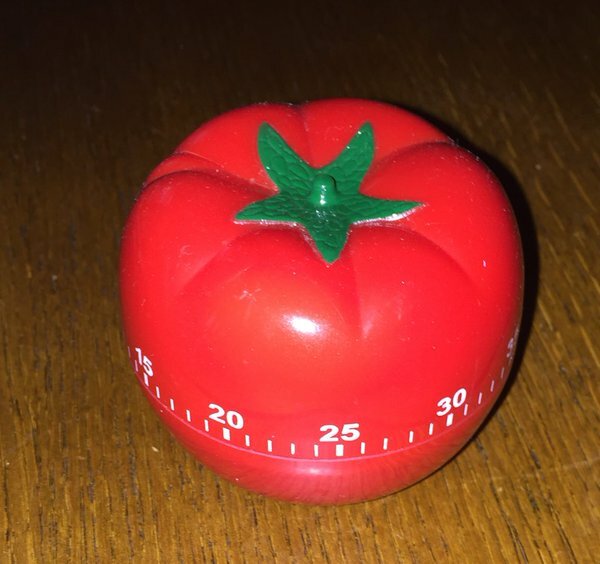 I also use the Pomodoro technique from time to time. I manage my tasks in Trello and the Pomello Google Chrome application is a great timer that integrates with Trello. It is a very useful technique to get things done.